This morning we woke up, had breakfast and set out for Ginza in Tokyo. Originally it was mainly so I could get some new clothes as I'd packed very little to bring with me, but thanks to Jetstar leaving Kate's luggage behind she also needed some new clothes. 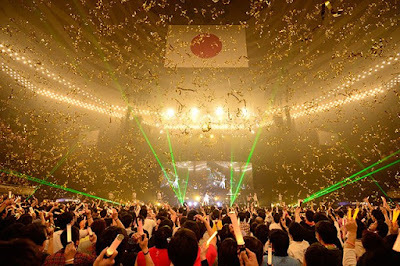 After that was the Lisani concert at 2pm in the Nippon Budokan!! The reason we headed to Ginza was we liked the clothes you could get a UNIQLO, and Ginza was their flagship store with eleven floors. A lot of the rest of Ginza is full of very expensive stores where people buy things for reasons I don't really understand, think overpriced "designer" type of things. Anyway, I hadn't brought anything to Japan with me mainly because I didn't really have any good warm clothing as it doesn't get very cold in Brisbane. All I have are some cotton jumpers, which are not suitable for proper cold. Unfortunately UNIQLO doesn't open until 11am, so at first we went to Don Quijote or Donki Hote which is how you say it in Japanese. This famous chain is kinda like a 100yen store in terms of the variety of goods for sale, but everything is priced individually and the quality and prices are higher. I bought some gloves which had sensitive pads you could use on touch screens which was great. We also got some beanies and toothbrushes which were also great. Something else we purchased were a pack of God Hot socks, though these were not as good as the UNIQLO socks we got later and we ended up ditching them eventually. Another reason we went to UNIQLO was for their heat-tech gear which we had heard was really good at keeping you warm. So when it opened we bought some socks, underclothing (thermals) and some great wool pants and jumpers. I also got a great jacket that had a removable lightweight down vest built into it that kept me warm throughout this trip. I think I paid around $100-150 for everything which is far less than I would have paid in Australia. After that it was concert time! As Kate didn’t want to pay $200 for a concert ticket I was just going by myself, so I left her behind at UNIQLO and made my way up to the Nippon Budokan. There was quite a crowd (the venue’s capacity is 14,471) and the path along the way was lined with dodgy looking people selling glow sticks and such. The last concert I went to everyone had light sticks except for me so this time I planned to buy one of the official ones for sale. To my dismay however I found that they were all sold out!! In fact all the merchandise had been cleaned out! I didn’t want to miss out on waving lights around again, so I went back down and bought some overpriced glow sticks from one of the unofficial venders. 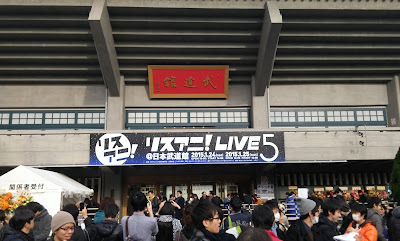 The Lisani Live 5 Sunday Stage concert was great and I had loads of fun!! The line-up was LISA, KOTOKO, ZAQ, ClariS, Suzuko, Kalafina and fripSide!!! Songs I remember especially enjoying: Alteration, One Way Road, and Sparkling Daydream by ZAQ; Connect by ClariS; oblivious, 音楽 and Heavenly Blue by Kalafina and the fantastic combined medley of LEVEL5-judgelight- 〜 future gazer 〜 eternal reality〜 only my railgun and then Sisters Noise by fripSide for the finale!! I probably had the worse seat in the place, (last row, at 90degrees from the stage), and my glow sticks were an issue as every single other person had an official electric one (or multiple) and they were usually set to a colour I didn’t have! That didn’t matter though as I still had a great time! Tomorrow we’ll be doing a cooking class before heading back to Narita for our trip over to South Korea! Sounds like fun. Sad Kate missed out. Copyright © Eric Thompson 2017. Simple theme. Powered by Blogger.